With harvest 2016 coming to a close and also the first year of our commercial sales of AminoA+ we thought we should review the results and also make some recommendations based on this years’ experience. OSR and Winter Barley yields were reportedly generally 30% down on 2015 levels this is undoubtedly a results of lack of sunlight in the early summer. (Two customers who also have commercial solar installations reported 27-30% less energy production in the May/June period which exactly seems to mirror this). Customers who used AminoA+ consistently through the season reported good results and quality with Malting Barley making the standard and bushel weight,even grown on sharp sand. Winter Wheat results were very good with yields generally in the 10-11.5 t/ha area and growers who used the product purely to increase proteins in Milling Wheat were satisfied with proteins in the 14% region. Growers now intend to use the product in their growing programme for the next season. Other Crops We also have had very good results in many different crops from Vines to Quinoa and there will be a lot more product out on farms next season. A leading Strawberry grower reported an increase in Brix of 8% which is consistent with work we have done in other crops and we are awaiting the results of a trial on Gala Apples with FAST at the moment. Our seed treatment work is continuing and our WOSR trial plots finished flowering 10 days before the untreated. We have now started a trial with Elsoms, and have replicated plots sown there, as well as trials in England, Scotland and Wales. Sugar Beet trial work is continuing in Germany. WW seed treatment is also looking promising with treated seedlings tillering significantly earlier than untreated and we are planning more trials this Autumn. 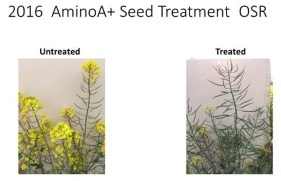 We have developed an organic formula of the seed treatment and are seeking approval from Soil Association and OF & G.
Whilst AminoA+ has always had approval for use by O F & G, Soil Association had not approved any hydrolysed proteins in the past. However, we have had approval from Soil Association to use AminoA+ on a trial basis this year so please ask! We are also working on a liquid formulation and hope to have this commercially available for the Spring. In the East Anglia area, we are able to offer the liquid formulation as an ‘on farm’ service this Autumn. Please ask for details. Apply 1.5 – 2.5 kg/ha AminoA+ post-harvest every 7-14 days through fertigation, or as a foliar, whilst the leaf canopy is intact, to build up the tree for the following season. Timings coincide with BYDV insecticide applications. Target: Winter Barley, Second Wheats and fields with variable soil types that are likely to suffer from stress in the growing season. Do not treat fields that have recently been treated with large quantities of animal manures unless the crop is suffering from other stresses such as frost damage, chemical damage or waterlogging. Spring Applications as soon as growth starts. T-1 timing with a further application of 1.5 kg/ha. Make further applications in response to crop stress. Final Applications: Winter Wheat (Feed) apply 1.5 kg/ha between boots swollen- mid flowering and in Milling Varieties at least 2.5 kg/ha to also increase protein. Alternative strategy is to put 0.5 kg ha AminoA+ in every tank mix (assuming water application rate of 100 litres/ha to give a 0.5% solution. In the case of stress events (waterlogging, frost etc) apply 2.5 kg/ha. As a general principle AminoA+ is compatible with fungicides and insecticides but always perform a bucket test first. Whilst generally compatible with PGR’s use minimum dose rates as excessive straw shortening can occur in dwarf varieties. Autumn Applications: Crops are now generally well established but we would recommend a small dose of 0.5 kg/ha if there are crops still being treated for CSFB attack. 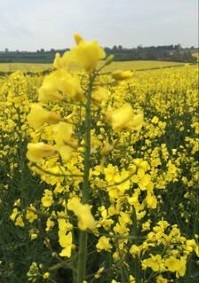 1.5 kg/ha should be applied before flower initiation which generally occurs from end November until February (late sown crops). Timings will typically coincide with Light Leaf Spot applications in November. Spring Applications: 1.5 kg/ha should be applied as soon as growth starts and then further applications made in response to crop stress. In the absence of stress apply 1.5 kg/ha at petal fall to extend greening and pod fill. In the case of stress events (waterlogging, frost, etc) apply 2.5 kg/ha. Mixtures with Crawler can cause extreme foaming!! AminoA Ltd. gives no warranty and accepts no liability in respect of physical compatibilities; therefore, use is at grower’s own risk. We are now also able to offer a courier service throughout the EU (48 hour).